Abdul Samat (front second left) and Zulhairy (front fourth left) in a photocall with participants of the programme. KUCHING: Malaysian Anti-Corruption Commission (MACC) has started the ‘Wira Anti Rasuah’ programme for students and educators in the state. 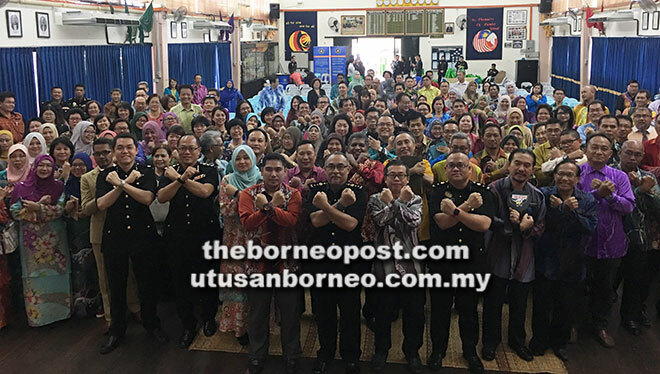 Its public education director Datuk Abdul Samat Kasah said as of now, they have conducted the programme at four schools in Kuching in an effort to fight corruption and abuse of power. He said the four schools included three primary schools namely SK Encik Buyong, SK Green Road and SJK Chung Hua No 4 and a secondary school namely SMK St Thomas. “If there is a wish and demand from other schools, we will conduct a similar programme for them. “Our goal is to educate and get closer to the younger generation especially students on the issue of fighting corruption because they will be the ones who will change the integrity of the country in the future,” he told the press at the closing ceremony of Wira Anti Rasuah’ programme participated by 230 students of SMK St Thomas here yesterday. Abdul Samat said the programme was introduced two years ago, starting with Chinese vernacular schools in the country. “Looking at the request from other schools, we are extending this programme to primary schools, secondary schools, Tamil national-type schools and also Maktab Rendah Sains Mara (MRSM). MACC Sarawak deputy director Zulhairy Zaidel and Kuching District deputy education officer Chen Fei Ming were among those present at the event jointly organised by MACC Sarawak and Kuching District education office.